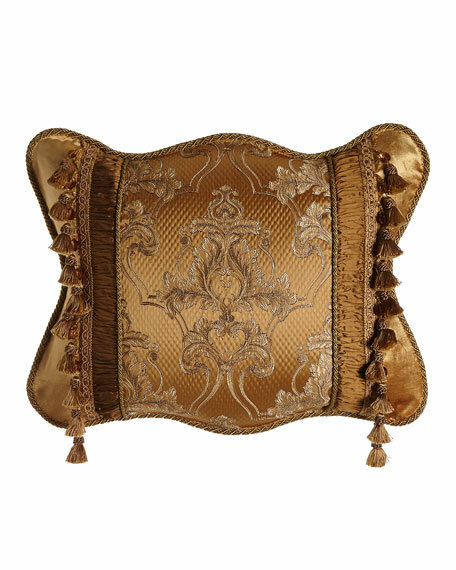 Damask center; ruched silk insets; beaded tassel trim; corded scalloped edge. Chenille jacquard center woven of rayon/polyester/cotton. Ruched silk sides and silk back. Finished with loop fringe. 20" x 26". Dry clean. Made in the USA of domestic and imported materials. Jacquard stripe sham has a 320-thread-count cotton sateen reverse. Dry clean. 20"T x 30"W. Imported. EXCLUSIVELY AT NEIMAN MARCUS Sham with Greek key border. 21" x 26". Long staple cotton. Machine wash. Made in Italy.